At 4:00 p.m. today, the center of Tropical Depression "CRISING" was estimated based on all available data at 300 km Northwest of Zamboanga City (7.5°N, 119.4°E) with maximum sustained winds of 45 kph near the center. It is forecast to move West Northwest at 19 kph. Southern Palawan will experience rains and gusty winds with moderate to rough seas. CALABARZON, MIMAROPA, Bicol Region and Eastern Visayas will have cloudy skies with moderate to occasionally heavy rainshowers and thunderstorms which may trigger flashfloods and landslides. 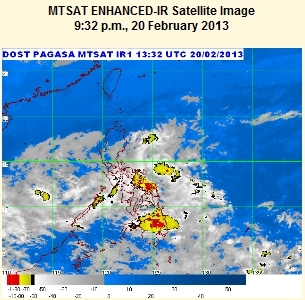 Mindanao and the rest of Visayas will be cloudy with light to moderate rainshowers and thunderstorms. Metro Manila and the rest of the Luzon will be cloudy with light rains. Moderate to strong winds blowing southeast to east will prevail over Mindanao and from the northeast over the rest of the country with moderate to rough seas.